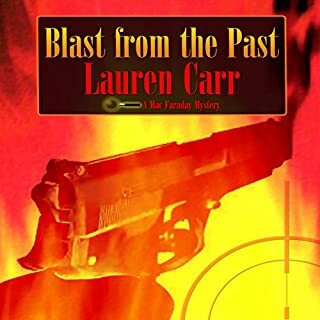 In this fourth mystery on Deep Creek Lake, Mac Faraday finds himself up to his eyeballs in mobsters and federal agents. Mac Faraday believes he has his work cut out for him in protecting his lady love from one of the most dangerous leaders in organized crime; but when bodies start dropping in his lakeshore resort town, things may be hotter than even he can handle. 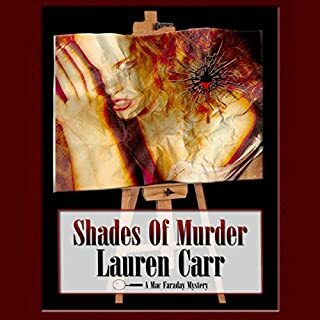 In Shades of Murder, Mac Faraday is once again the heir to an unbelievable fortune. This time the benefactor is a collector of stolen art. But this isn't just any stolen work of art - it's a masterpiece with a murder attached to it. Ilysa Ramsay was in the midst of taking the art world by storm with her artistic genius. Hours after unveiling her latest masterpiece, she is found dead in her Deep Creek Lake studio, and her painting is nowhere to be found. This chilling collection of modern horror stories is sure to have you peeking warily around corners and walking just a bit faster down dark streets. Full of both creepy events and morbid humor, The Bacchanal stands as a testament to humanity's love of being afraid and of frightening others. Humanity's fear of the unknown and fascination with the supernatural are masterfully depicted in these 11 stories. I admit that I don’t usually read short stories, usually because you might get one or two good stories but the rest don’t really catch my attention. But since I love horror and thrillers I was excited to review The Bacchanal: And Other Horrific Tales. There are twelve tales that will thrill you with supernatural creatures and the depravity of human nature. All of the stories were really good but I will agree with other reviewers, my favorite was TS Hall’s The Encouragement Specialists. This is definitely a story about an offer too good to be true. Keith McCarthy does an amazing job reading this story. If you like good horror stories look no further. This collection will be one that you keep. I originally reviewed this book on July 21, 2016. I feel the same way about the audiobook as I do the ebook. This is a great collection of stories that any horror fan will love. Rowen Locke has struggled to keep the peace between all races since the end of the War of the Lotus 3 years earlier. But people are quick to forget how magic, the Shel’ai, and others brought peace, it is easier to remember the old hatreds. Then there is a new Shel’ai called Algol that has plans to bring down this world. Algol has partnered with Crovis Ammerhel and is planning on bringing down the Dragonward and return the dragonkin to this world. But Rowen Locke, Maddoc, Igrid, and others are going to do whatever they can to keep that from happening. Rowen is doing his best to protect those that he loves, even though everyone else seems to be against him. But he is loyal and determined, even if he is arrested, falsely imprisoned, beaten, and threatened to be executed. I loved Igrid, she is strong and determined and won’t quit no matter what. You can tell that she loves Rowen deeply although I think she was going to kill him. Algol is a powerful She’ai and has his own history but he is willing to do whatever it takes to bring back Nekiel. If you like epic fantasy stories you have a read this one. This is an amazing story with lots of action, death, and a serious bad guy that has plans to destroy everything. What more could you want? If you like audiobooks, make sure to check out the Audible copy. The narration was amazing and helped draw me into the story. 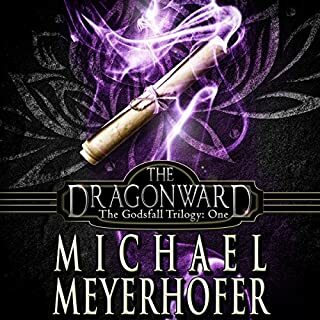 I received The Dragonward from Sage’s Reading Room for free and I also purchased a copy of The Dragonward from Audible. This has in no way influenced my opinion of this book. Gina is a successful doctor in Chicago but she is haunted by dreams of someone hunting her down. Gina great up on a family farm that was very secluded from modern day and had a troubled cousin that came to live with her family, Jake. She changes her name to try to stay away from him but he is obsessed with her. Jake and his two partners in crime are on the run from the police as they look for another victim that looks like Reggie Lee to have some fun with while they still look for Reggie Lee. Although Gina is trying to stay hidden, her high profile surgery is going to throw her right into the limelight and into the killer’s hands. This story goes a roundabout way to learn about Gina’s past as she is remembering in her dreams. Thankfully Elisabeth Reinhardt is her therapist and can help her work through the memories and help her prepare for the potential attack from Jake. I really liked Elisabeth. She has her own history that makes are a tough gal to mess with along with a great connection for a network of people that can help. I liked the story and how Gina was always on the run until she started doing things to get her ready like self-defense classes, shooting classes, security systems and such. I love when a character prepares to fight back instead of just cowering and hoping for help. Gina is a great strong character and I really enjoyed watching her with her surgeries and found it hard to learn of her past abuse. The one thing that did get to me was the story seemed to drag and drag. I think that a good chunk of the story could have been taken out and made everything flow better. Nancy did a good job of narrating the story. It was easy to understand the different characters. Overall I liked the story. It was a little slow in the beginning and I kind of forced myself to keep reading. I am interesting in reading the next book to see what happens with Elisabeth next. 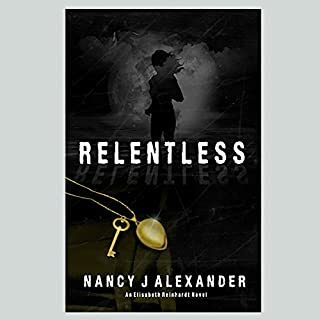 I received Relentless from iRead Book Tours for free. This has in no way influenced my opinion of this story. We start the story from the view point of a housekeeper at Astaire Castle. Famous author Damian Wagner is staying at the castle to write the last book in his series. But there are some strange happenings that revolve around the myth of a wolf man. 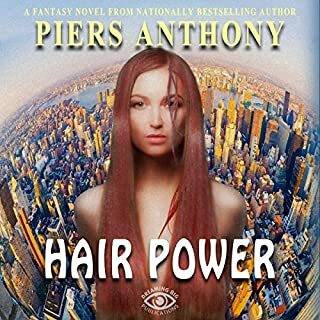 In present day, Mac Faraday is helping look for a missing lady and stumbles upon the information that he has inherited a castle along with his property. But the castle is cursed and his mother had it locked down to keep others from dying too. Too bad that when he plans on exploring the castle, the corpse of Damian Wagner is discovered, a wolf man attacks Mac and billionaire that refuses to take no for an answer are going to make this an interesting story. This is my first Mac Faraday story and I am absolutely in love. Mac is a former detective that has inherited the fortune of his late mother, famous mystery author Robin Spencer. Those detective skills are going to be needed to figure out who killed Damian Wagner, who the wolf man really is, and what happened to the missing Damian Wagner manuscript. This story is fast paced, engrossing and give a great ending that I didn’t expect. Of course I loved Gnarly and one of my favorite scenes is him dumpster diving for chicken bones. 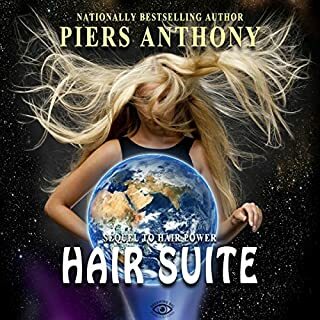 I was lucky enough to have been given the audiobook for review. The story was narrated by Dan Lawson and he did an amazing job. It was easy to tell which character was which and the pacing was amazing. My only complaint would be that the rest of the series on not on audiobook yet, just some of them. But this has not stopped me from purchasing the remaining books in the series on kindle. I have a new favorite author. Definitely check out this book and series. You will not be disappointed. 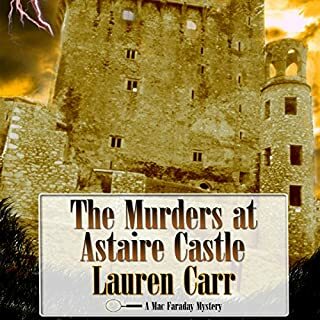 I received The Murders at Astaire Caste from iRead Book Tours in exchange for an honest review. Niri is a Priestess of water that failed to identify an elemental during the festival. She wants to make amends to her order and goes on the hunt for this girl. But when she finds Ria she realizes there is more to this girl than what she originally thought. So she goes on a quest to find out the truth about Ria’s powers and her own. Lavinia and Ty are brother and sister and friends to Ria, they go along to keep Ria safe but end up learning more about themselves. But this is a race against time since the Curse has been released to hunt down Ria. But secrets about the church are going to be exposed and Niri is going to learn that although she is the weakest of the elementals she has more power in her than she knows. When elementals are discovered, they are taken away from their families and indoctrinated into the church. This is the only life Niri has known for years and at first those teachings is all that she sees. But as the story progresses she learns that there is more to the story of the church and it is not as wonderful as she has been told. Ria has this amazing power but she is scared to use it because of the Curse hunting them down. I loved watching her grow throughout the story. Ty has his own secrets and at first hates Niri. But when you learn about his apprenticeship you can understand his feelings. And then there is Lavinia. She is a young girl ready to go into her apprenticeship and along for adventure but finds her own, unconventional place in the world. This book is full of action, adventure and wonderful locations. It is very descriptive and draws the reader in. I listened to the audio book and couldn’t wait to get back to it as soon as I had to stop. Thom Bowers did a wonderful job of narrating. It was easy to follow along with each character. If you are looking for a new young adult fantasy series, this is the series for you. I strongly recommend checking out Born of Water. As for me I can’t wait to read Rule of Fire or even better listen to it on audiobook. 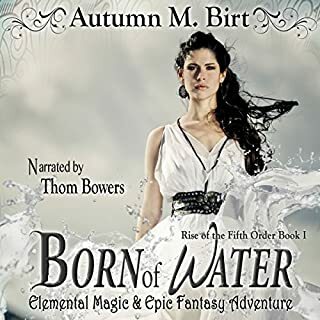 I received Born of Water for free from the author in a giveaway. What is your destiny? This question haunts 20-year-old Jamie Collins. A junior at Santa Clara University in 1986, Jamie has friends, a professor who mentors him, and a promising future as a writer. 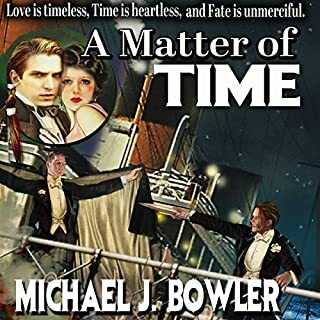 Then the dreams begin - nightmarish visions that transport him to a time and place fifty years before he was born: Titanic's maiden voyage in 1912! With less than a week to go before the 74th anniversary of its sinking, Jamie discovers that his fate is inexplicably linked to that of the famous vessel. Somehow, the two timelines are overlapping, and when Titanic dies this time, Jamie will die along with it. Would you consider the audio edition of A Matter of Time to be better than the print version? It is 1986 and Jamie is a junior at Santa Clara University. He wakes up from a dream where in it he is attacked. Shortly thereafter he starts being lethargic during the day, the sunlight burns him, and then feels super strong at night. Jamie becomes obsessed with the young man is in the dream and trying to figure out what is happening. At the same time his friend Jay and Maggie visit Jay’s great grandma about a diary she kept her whole life. Maggie is writing a paper on the Titanic and things this can supplement her paper. Jamie keeps getting sicker and sicker until he realizes that Jack, the man from the dreams is on the Titanic. Jamie decides to go to the coordinates of Titanic to catch a ride. His plan is to stop the attacker but ends up meeting widowed Kate and her 10 year old son David and falling in love with Kate. But it’s clearly not meant to be since the Titanic will be sinking in a couple hours. Jamie is torn between saving the passengers and how this would affect history. Jamie is a fan of science fiction and horror. So when he starts having the dreams everyone thinks he is just writing a story. But it is clear something is very wrong and then he becomes obsessed with the Titanic. He even manages to make it aboard Titanic. This is a great story. I admit that at first I had a hard time getting into the story. It seemed to drag but I think that was just me. I loved the paranormal twist and the wrong information that it leaked. It’s hard to go into this without giving it away. Trust me you will like it. I received A Matter of Time as an audiobook through Audible. Aaron Landon narrates the book and he did a wonderful job. It was easy to listen to the story and understand the different characters. I especially loved how the story ended. It was a great, warm, fuzzie moment. This is a wonderful story and I recommend that everyone check it out. You will not be disappointed. I received A Matter of Time for free from Sage’s Blog Tours and the author in exchange for an honest review.